At its core, the One is an Android 4.1.2 device (Jelly Bean). However, HTC would like to put an emphasis on the custom job that it has put much more on the mobile operating system of Google. Also known as Sense 5, the next generation of user interface is developed from the previous versions – we would dare say that it is a totally different experience, much like Sense 4 compared to the version 3. The fourth generation is a remarkable improvement, because HTC finally combined these ideas with the overall design guidelines of Google. 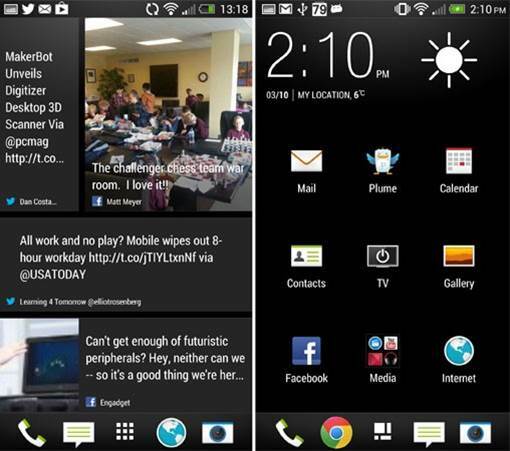 Now, with Sense 5, the UI has changed almost everything, from the home page to the core HTC applications, it is better than Sense 4 in some respects, but in other aspects it is a backward step. At its core, the One is an Android 4.1.2 device (Jelly Bean). However, HTC would like to put an emphasis on the custom job that it has put much more on the mobile operating system of Google. 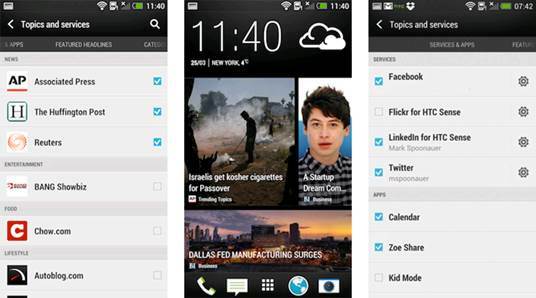 Also known as Sense 5, the next generation of user interface is developed from the previous versions. For basic navigation, Sense 5 devices use the two soft keys. This is a major deviation from the Sense 4 devices, which use a three-button setup including back, home and recent apps (the latter can be customized to work as the menu button if you want). One the other hand, the One provides only back and home keys. A long-press on the home button triggers Google Now; while double-tapping the same button offers a new recent apps menu that is much innovated over the card-style version on Sense 4 which reminded us to remember the Windows Phone and webOS. Cards are still present this time, but they are much smaller and you can see nine cards in total. You can click each card to remove them, but because we prefer to have more than nine apps open at the same time, this restriction also proves to be too restrictive for our favorites. Since Sense 5 gets rid of a menu key, it means that many third-party applications have to be put into the virtual menu key at the bottom of the screen. This left us a feeling as a step backward, especially after the One X was updated to allow menu function on the recent apps soft key. The most interesting change in the UI is BlinkFeed, which takes charge of the default home page. Because of many tiles with a variety of shapes and sizes, the tool is like Flipboard, Blur UI of Motorola and even Windows Phone. (We would dare say it brings back memories of the Microsoft Kin?). The idea behind the service is to bring up the content from your favorite publishers and social networks - Engadget, Twitter, Facebook, LinkedIn and Flickr are just a few examples - and combine it all together to browse easily. In practice, the word "normal" will be the main focus here: in addition to the normal notification bar, BlinkFeed will not have emails or any other important updates. If something that is interesting appears in your feed, just tap on any tile to read the post or just related status updates. There is a modern clock and weather utility at the top, but it only appears on the main screen - it disappears as soon as you start scrolling down into the depth of the feed. There is a modern clock and weather utility at the top, but it only appears on the main screen - it disappears as soon as you start scrolling down into the depth of the feed. Fortunately, you still completely control over BlinkFeed through a hidden pull-down bar nestled between the tiles and clock utility, which is accessed by pulling your finger down on the startup page (you are also able to use this gesture to update your feeds manually, although you are able to set it to automatically refresh on mobile data and WiFi or WiFi-only). A tab on the left allows you to select the feeds you want to see, for example, you can choose to only see updates or select all the interesting topics to you. If you want to change the selected feeds, just go to the settings, found in the BlinkFeed menu. In addition, you will also find the options to post to Facebook or Twitter directly from this bar. Finally, an SDK will be provided so that the developers are able to publish their applications to BlinkFeed as a means to make the service become more useful. 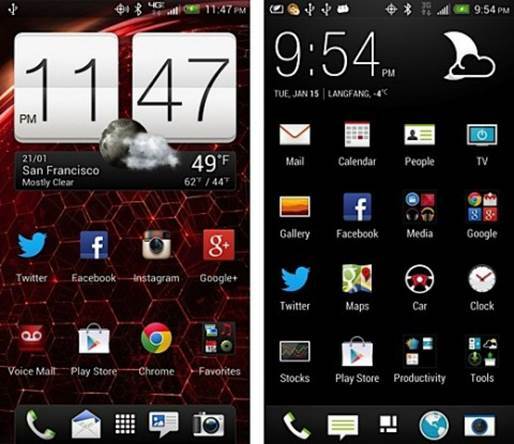 This is what we are looking for; the whole concept feels as if it would be a drastic change from the stock Android. Fortunately, in case you do not like the BlinkFeed being the default screen whenever you open your phone - it really is a great diversion other than anything we've seen on Sense or Android in general, so it will not satisfy everyone - you can select another homepage. However, it does not seem that there are ways to disable it completely, so you are stuck with that it occupies one of five main panels. This leads to our own main disappointment: while the idea behind BlinkFeed is not bad (we imagine news junkies and social networkers may find it quite convenient), it causes Sense to feel a little too messy with unnecessary bloatware and the users should be offered the option to disable it if they do not have any benefit from it. It should be taken notice that the BlinkFeed’s tiled layout is not limited to the main panel; it really is a repeated theme in the gallery. The application uses titles to allow you to choose between your private galleries, friends' Facebook albums and other online services such as Dropbox and Flickr. When you go into your private photo albums, you are able to see some pictures moving – these Harry Potter-like movies are located in your once-stagnant album are Zoe shots. Each image (Zoe or otherwise) can be marked as a "highlight" so you can show off to your friends and family the best photos from the vacation at Disneyland instead of all of them. You are also able to upload these precious memories to Zoe Share, a service that produces a URL to present a maximum of 10 images that you can share with anyone you like - whether they are Zoe or old stills. Each website acts for 180 days, in case your loved ones or stalking folks want to visit again. (We have created a sample URL for you to take a look at here).